My hunting partner was new to calling bobcats, and before situating him under a low cedar, I explained that cats appear like a wisp of smoke in the woods. If you aren’t scanning every approach, they can come and go without you even knowing they were there. Then I took a seat of my own hunkered down 10 feet away in leafy oakbrush and used the remote to kick on the FoxPro caller I had set 20 feet below us. The first series of rabbit squeals was still echoing down the rocky canyon when a big tom bobcat literally leaped over my buddy’s shoulder and landed 5 feet away in a flurry of dry leaves. He didn’t have a shot, of course, but his first day calling cats sure got off to a flying start! A couple of years back, the pelts of Western mountain bobcats, or lynx cats as the premium pelts are known in the fur trade, peaked at more than $1,000. While an extra-large tom with a wide, snow-white and heavily spotted belly may still see $500 this season, the rest will likely sell for half that or less, perhaps a lot less. Slumping pelt prices are not good news for trappers and hunters who count on a fur check. But over the next few seasons, it could present an opportunity for sport hunters looking for adventure. Even when pelt prices are high, you have to know what you are doing to trap enough bobcats to cover the costs of a longline in the mountains and still make any money. The guys who can do it will keep going, as those pelts are still the most valuable fur this side of the Canadian border, maybe anywhere. But the rest will likely pack it in, and the pressure on the cats will surely decline. Sport hunters have a much different mindset. While my buddy didn’t tag that high-flying cat, he tells it as one of his most exciting hunt stories. And with bobcat’s thriving throughout much of their range, less competition in the field can only improve his odds of tagging one the next time out. A little farther east, in the prairie and Midwest states, bobcat populations are probably at or close to carrying capacity. In Iowa, where I spend the fall outfitting deer hunters and the spring chasing turkeys, I see signs that burgeoning bobcat numbers may be starting to hurt the numbers of other game species upon which the cats prey, especially turkeys. When the price of bobcat pelts skyrocketed in the late 1970s and early ’80s, many states reclassified them from a predator that needed to be controlled to a resource that needed to be conserved. Many of those states still enforce conservative bag limits, and that keeps bobcat numbers inflated through weak and strong fur markets. It can be a real hunting opportunity, and if you want the Western road trip, too, that’s also doable. 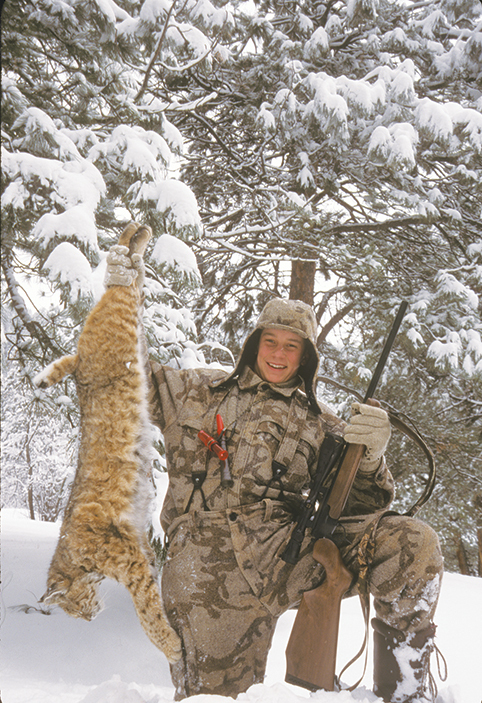 Montana and Nevada may not let nonresidents hunt bobcats. But Colorado does, and the high country supports fair populations. You do need a nonresident small-game license, but there is no limit and no extra cat tags required. The license costs $56, and you also need a $10 habitat stamp with your first license purchase of the season. Utah charges $45 per bobcat tag with a limit of six. A $154 hunting license is also required, and if you were born after December 3, 1984, you must pass a fur-harvester education course to get the tags. Wyoming doesn’t require a license for predator hunting, but since they classify the bobcat as a furbearer, you need a $242 nonresident furbearer license to take them. There is no limit. Idaho also has lots of cats, and no limits. The nonresident license costs $98 for the season or $35 for a three-day permit. The animaniacs in Arizona managed to get trapping on public land outlawed years ago, and now the state has a thriving predator population—including bobcats. A $160 combo hunting and fishing license (the only one available to nonresidents) also allows an unlimited take of bobcats. If you are traveling to the land of fruits and nuts, also known as California, you can pick up a $163 season license, a 3-day license for $47, or a 1-day permit for $23. The limit is five bobcats. A CITES tag will be needed to bring a bobcat pelt home or sell it in any state, and the pelt needs to be tagged by someone with the state. Cross any state line with a bobcat pelt that hasn’t been CITES-tagged, and you are in violation of federal as well as state law. I see no rhyme or reason to the vast divergence in state laws and regulations when it comes to hunting bobcats, and all of these laws are subject to change. So the first thing when considering a cat hunt anywhere is to contact the state wildlife agency and get the latest skinny on bobcats and hunting in general. Calling bobcats is also a bit different in each state, but in general, the rugged hills, canyons and mountains of the West offer prime bobcat habitat with plenty of cover for the cats and also the host of furred and feathered critters they eat. Mountain bobcats prey on everything from mice to turkeys, deer and even elk. Most high-country regions support a healthy population of bobcats, if not at the densities found in similar cover at lower elevations. In the high country, bobcat density often comes down to the number of competing predators, namely coyotes, cougars, and to a lesser extent, bears. Coyotes also make short work of any bobcat they catch on the ground. Cougars, too, dine on the smaller cats. Back when government coyote control programs were still effective, before the use of poison was severely restricted in 1972, the high country of southwestern Colorado supported a thriving population of bobcats, gray and red fox. At that time a prime bobcat pelt was worth $10-$15, so the trapping pressure and hunting competition were both relatively light. When I moved to Pagosa Springs in 1970, seeing a fresh coyote track in the snow was a rarity, and I took 35 bobcats the first season hunting with calls and hounds. Any road-killed deer or elk would have bobcats working it within a few days. But by 1975, the cat population had started to decline, and by the way they acted, I’d say about half the cats I ran with hounds that season already had been chased by coyotes. Calling was a tougher proposition, too. The red and gray fox also declined greatly due to surging coyotes, which not only compete with the smaller predators for food but also prey upon these lesser canines. In general, the high country of the West does not support the same density of wildlife as some other regions because of severe winters at high elevation and shorter growing seasons for plants and animals alike. Rodents do not produce the same prolific numbers with fewer breeding cycles each year, and there is only so much food for a limited number of predators. Competition with other predators also affects how high-country bobcats respond to a call. Despite the little story at the start of this article, the rule is for bobcats to stalk a call slowly, the same stealth tactic they use for ’most all of their hunting. The exceptions occur in heavy cover. I’ve seen bobcats in south Texas brush country come on the dead run, intent on being the first to get to that squealing, squalling meal. Even with an abundant number of coyotes in these areas, the cats must feel there is enough climbable cover to escape a close encounter. Not so in the open high country, where a cat has to be careful it doesn’t get caught in the open by a coyote or mountain lion. That’s one reason I prefer to do my high-country cat calling in heavy oak or cedar where the sight lines may be limited but the cats feel more comfortable responding to the call. I have had by far my best results with high-pitched cottontail rabbit sounds. I’ve also called the cats with jackrabbit sounds and believe that even though jacks are scarce at elevation, the raspy sounds are similar enough to mimic a fawn deer or elk calf, sounds I also use from time to time. Where the calling pressure seems to be holding back the response, I may try rodent squeals, woodpecker sounds or something else a little offbeat. When targeting cats with any of these calls, I stay on stand at least half an hour to an hour, whereas when calling coyotes I may leave after 10 or 15 minutes without a response, depending on conditions. Another major consideration is the high-country’s very different terrain. You aren’t going to get a gangbusters response from scarce bobcats in rugged canyons and heavily timbered slopes. It can frustrate even a good caller who is used to seeing coyotes and fox with some regularity. As I like to say, the best caller in the world isn’t going to get a response if there isn’t anything within hearing distance. Another of my favorite sayings is that the hunter who works the hardest is going to get the luckiest, and that goes double for calling high-country cats. A good way to increase your odds and also learn about cat habits and patterns firsthand is to get out after a snow, find a fresh cat track, and follow it. Hunting sense and experience will tell you when you are getting into country where the cat is likely to be laid up or bedded for the day. Then you start looking for a calling stand. This is one of my favorite techniques, and I have shot a number of bobcats that I jumped out of their beds, especially in more open sagebrush and high-desert country. But I have called far more of them out of the rocky outcrops, rimrock, dense willow thickets in creek bottoms, and impenetrable patches of greasewood and sagebrush. Where the roads allow, you may cut tracks by simply driving around likely areas in a four-wheel truck, ATV or snowmobile. Where you see tracks crossing the road into a section, if possible, circle that section to see if the tracks come back out. If they don’t, you can bet the cat is in there somewhere, and you may be able to set up a stand with much better chances. By finding several such areas early in the morning and then going back to them later in the day, you can greatly increase the efficiency of this tactic. Just knowing there is a bobcat within hearing can do wonders for your staying power. Once you figure out what kinds of places cats in that area prefer during the day, and locate a few specific spots for stands, cat-calling success will increase dramatically. When calling in open high country, I tend to crank up the volume. Timbered, snow-covered ridges and canyons really absorb sound. I am also trying to reach out a lot farther than in the closer quarters of a river bottom. So go ahead and turn it up. Bobcats mainly hunt with their eyes, but their hearing is very acute and I’ve glassed them coming to my calls from a half-mile away. On a still, cold day at high altitude, I’m sure they can hear a loud call from much farther away than that. I do start off at low volume, especially when close to what I think may be bedding or daytime hunting cover. But if nothing shows, I gradually increase to full volume. Once a cat’s centered on the sound, excess volume doesn’t seem to deter it much if at all. I’ve watched many a bobcat come right on in while I’ve been blowing a mouth call at full volume or had the electronics on high. Just remember that the cats also sneak in, so don’t be shocked if your first sighting is a cat sitting nonchalantly at point-blank range. It’s not only disconcerting, it’s also a good reminder to sit motionless when calling bobcats no matter how much sound your mouth call or speaker is broadcasting. Several winters back I took Scott Green, a noted gunsmith and friend from Denver, along on a high-country calling venture with my then-young grandson Zane. Early in the morning, I called in a coyote that stopped head on at 10 yards. Zane suffered a bit of “coyote fever” and about broke the trigger off his little Model 7 Remington before he realized the safety was still on. When he finally shoved the safety off he jerked the trigger at almost the same time. The coyote may have got a bad headache from the muzzle blast and the crack of a bullet passing between its ears, but other than that it escaped unharmed if a bit call-shy. Our next stand was in canyon country where I had trapped a number of cats, so I advised my companions we would stay a bit longer on stand and to remain as motionless as possible while keeping a sharp lookout for a bobcat as well as coyotes. Ten minutes into the first call sequence, Zane, sitting shoulder to shoulder with me, jabbed me with an elbow and whispered there was a coyote coming through the dense oakbrush. I caught movement about 50 yards out, and Zane whispered he could see the outline but not the whole critter. I told him I would lip squeak, and when he did see a front shoulder, put the crosshairs on it and shoot. At the sound of the squeak, the critter took a cautious step forward and Zane whispered “cat!” half a second before he hit the trigger and sent a 53-grain hollow point into the big tom’s chest. The first Scott or I saw of the sneaky feline was when Zane proudly hoisted it up out of the oak leaves. Whether you hunt close to home or trek to the high country, a winter cat hunt is a great way to cap the season. Unlike coyotes and fox, cat fur is often at its best February into March, and if you do happen to tag a couple or three prime mountain lynx cats, you may even be able to pay for the trip. For the sport hunter looking for adventure, I can’t imagine it getting any better than that.